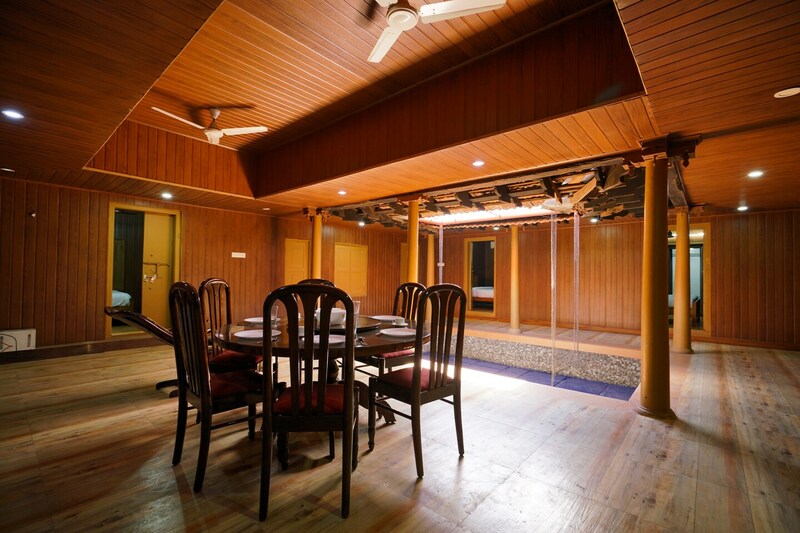 Constructed in the traditional nalukettu style, Home Elegant BHK Pukalakkattu Heritage Home located near the Jawaharlal Nehru Stadium gives the feel of a traditional house with clay roof tiles. Typically considered to be part of Spanish and Italian architectural styles, especially in coastal Kerala, the red roof tiles make this property a gorgeous choice for travellers.The wooden decor of the rooms, much like rooms in hill stations, is a welcome surprise. With comfortable bed and various basic amenities catered for a pleasant stay, guests can be assured of a relaxing stay.The little indoor courtyard is the perfect place to sip on a coffee, read a book and take a little afternoon siesta. Guests can also lounge on the front veranda.